What Now for P.K. Subban? Guy Lapointe, aka “Pointu,” holds a Montreal Canadiens team record that might surprise you. In 1974-75 the hard-hitting defender scored 28 goals, putting him ahead of legendary Habs like Doug Harvey, Larry Robinson and the not-so legendary Sheldon Souray. Souray came the closest to Lapointe’s franchise high with 26 goals in 2006-07. 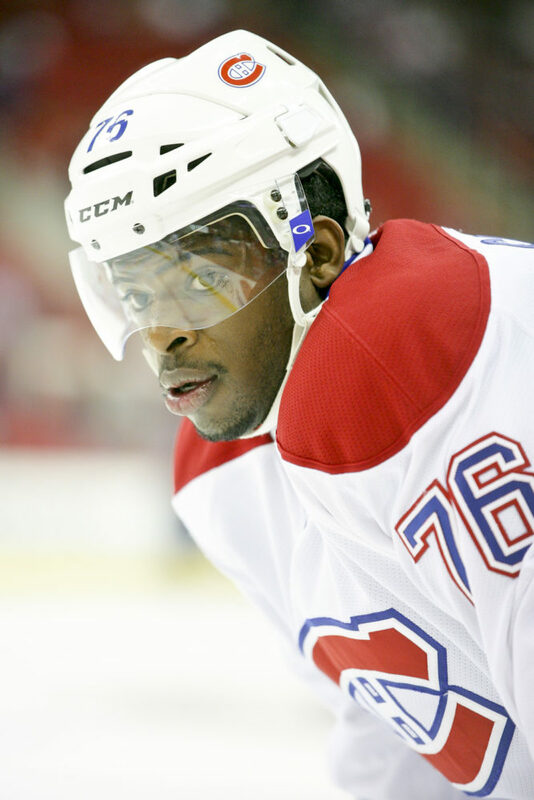 Subban has yet to play a full 82 game season with the Canadiens, having laced them up for 81 in 2011-12 where he totaled 7 goals and 29 assists for 36 points. Last season, he scored 11 goals and added 27 assists, topping his previous year’s totals in less than half the games. Subban will undoubtedly top the 20 minute mark per game this season (he averaged 23:15 last year) and has become the team’s defacto number one d-man, ahead of the now cadaver-kneed Andrei Markov. So where does P.K. go from here? It’s typical for most athletes to have a drop in production once they’ve netted their big contracts (look out Edmonton Oilers) and we saw that in David Desharnais’ play last season after GM Bergevin signed him to a four-year, $14-million dollar extension. But that’s not the case this time for Subban. Last year he swallowed his pride and took Bergevin’s two-year bridge contract, accepting the challenge that should he continue his march towards becoming one of the league’s elite rearguards, he’d ultimately get the kind of payout that the likes of Karlsson, Doughty and Weber (rightly or wrongly) have already achieved for themselves. Subban enters the last year of that two-year, $5.75-million dollar contract this season. So the soon-to-be All-Star defenceman has a lot to play for and could be on track for a mighty pay day if he knocks it out of the park this season (hey I miss the Expos), setting himself up for at least a 6 year deal at $7 million per. Remember a few seasons ago when he couldn’t get slapshots through opposing shotblockers? Subban lost the wild wind-up and now gets his shots off quicker — and harder. He has the ability, as did Sheldon Souray, of blasting the puck not only past but through goaltenders. And his one-timer from inside the blueline is money when it’s on net. It’s fair to say that with a full season, Subban could have at least scored 20 goals last year. This year, he comes to camp with a veteran attitude and is apparently in the best shape of his pro career. With lots of time on the powerplay (the Habs were at the top of the league of powerplay opportunities last season), combined with his overall ice-time, Subban could — and maybe should — break Lapointe’s record for goals scored in a season. A lot of naysayers out there blame Bergevin for not locking up Subban to a long-term deal last year where he could have gotten him at a cheaper price. But then P.K. wouldn’t have that additional motivating factor coming into this season. And with the cap going up next year, Bergevin will be in the position to open up Geoff Molson’s coffers and give him what he wants because now, Subban will have earned it. And you can bet if he takes care of business this year, Subban’s agent, Don Meehan, will make sure of that.